Summary: Neither candidate in France's presidential election has addressed the growth and competitiveness issues underlying the country's economic problems. But failing to grapple with them could be ominous for the entire eurozone. The first round of the French elections is over, and the Socialist Party’s slight edge has raised the possibility of a Left victory for the first time in nearly twenty years. But would this mean a change in France’s economic future? Both of France’s presidential candidates headed to the May 6 runoff election—front-runner François Hollande and the current president Nicolas Sarkozy—have proposed ways to bring down France’s high budget deficits. But they have sidestepped the deeper and more fundamental challenges of restoring the country’s competitiveness and igniting growth. Addressing these issues will determine whether France—the second-largest economy in the eurozone after Germany—helps pull Europe out of recession or becomes mired in the same slump that has engulfed the periphery. The two major political parties in France, along with the public, are reluctant to face up to the fact that the state’s enormous largesse will need to be reined in. Broadly speaking, Nicolas Sarkozy is pro-business, while François Hollande is pro-labor, but both candidates support a strong role for the state. The political Right, including Sarkozy’s Union pour un Mouvement Populaire (UMP), is not a strong defender of either the market or globalization, favoring economic self-sufficiency and a strongly independent defense and foreign policy. President Sarkozy’s record during his first presidential mandate shows that he conforms to his party’s platform, as a supporter of industrial policy, national champions, and increasingly, protectionist trade policy. France’s main party on the left, the Socialist Party, is also suspicious of the market. Unlike the Labor Party in Britain, France’s Socialists under François Hollande remain caught up in a decades-old narrative of class struggle, the central role of the state, taxation of the wealthy, and strong entitlement programs. Like its politicians, the French public does not place much trust in free-market solutions. A GlobeScan poll in March 2012 revealed that, while a majority of between 55 and 70 percent of citizens in Britain, China, Germany, and the United States agreed that a free market constitutes the best economic system, in France only 31 percent did. People like the public health system (Sécurité sociale), which delivers quality care for all with far better health outcomes than in the United States at two-thirds the cost, measured as a share of GDP. 1They support the resource-transfer system that guarantees a pension for all upon retirement at age sixty-two, a safety net for the least privileged, assistance to working mothers, and tax rebates for a third child. They enjoy the high-quality infrastructure and, above all, the labor market protections that provide workers with unprecedented job security, generous vacations, and a thirty-five-hour work week. They don’t like France’s stubbornly high unemployment (10 percent in February 2012 and even higher among youth), but they attribute this less to labor market rigidities and loss of competitiveness than to job outsourcing, low-wage competition from Asia, and harsh market outcomes. In this election, neither of the candidates is telling the French public that their much-loved system of state intervention and labor protections cannot continue in its current form—no matter how true that may be. To put a finer point on it, they are not telling the electorate that the system, made possible by three decades of post–Second World War high growth, is now being financed at the margin by public borrowing. The current system is unsustainable. 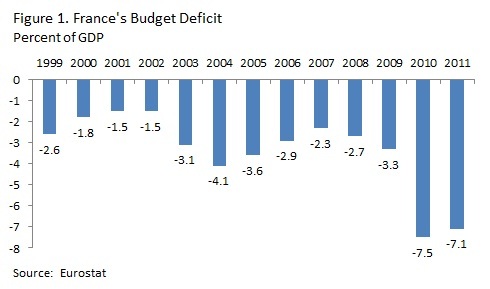 Ever since the euro was created, France’s government spending has exceeded revenue (see Figure 1). The country’s current sovereign debt stands at 89 percent of GDP—not (yet) disastrous. But it is troubling enough that in January 2012 Standard and Poor’s decided to downgrade France’s government debt from AAA to AA+, a reaction to the country’s persistent budget deficit and feeble response to the eurozone crisis. Both candidates recognize that France’s budget deficit must be brought down and would like to increase the government’s total take to solve the deficit problem. But their approaches reflect the differences in their political outlooks. Mr. Hollande suggests increasing taxes on the wealthiest to a rate of 75 percent for taxpayers earning over €1 million per year and 45 percent for those earning more than €150,000. Meanwhile, Mr. Sarkozy proposes to cut spending by continuing the policy of hiring only one civil servant for every two who retire and extending the practice to local authorities. He, too, wants to increase taxes, and suggests imposing a minimum tax on French companies and taxing financial transactions. But the candidates are not discussing France’s real structural issues. First, for over ten years, France has not had robust economic growth. Second, public spending now accounts for 57 percent of GDP (see Figure 2); even before the current crisis, it stood at over 50 percent. Third, France, as one of the most highly taxed countries in the world, has limited potential for further fiscal mobilization. Fourth and most important, France’s firms and workers are no longer competitive compared to their peers, in particular Germany. In the eurozone, France has always been considered a member of the core with Germany, not of the periphery with Greece, Ireland, Portugal, Italy, and Spain. France’s budget deficit is not in the same league as Greece’s; it does not face a massive debt mountain like Italy; nor is it dealing with the aftermath of a housing bubble like Spain and Ireland. But in terms of poor competitiveness, it is squarely in their camp. To get out of the current morass, increasing the tax burden—a solution proposed by both candidates—will not be enough. France will not be able to reduce its budget deficit without stronger economic growth, which requires improving France’s competitiveness and expanding exports. The reason for France’s loss of competitiveness compared to Germany (see Figure 3) lies deep within policy choices that date back half a century and how those policies relate to the euro. Historically, the policy choices of the two countries could not be more different. Germany, reeling from Weimar Republic hyperinflation, built its postwar growth on a strong deutsche mark. Internal adjustments in the labor market, control of the wage bill, and prudent macroeconomic and public expenditure policy led to productivity gains; reunification in 1990 bolstered the internal-adjustment mind-set. Since the creation of the eurozone a decade ago, European Central Bank monetary policy has been closer to that of the Bundesbank than of the Banque de France, so Germany’s 2002 adaptation to the eurozone and the strong euro did not constitute a break with former policy direction. France, by contrast, had always exercised looser monetary policy than Germany. Before the introduction of the euro, France was able to contain labor costs without major internal adjustment and labor market reform by the selective and controlled devaluation of the franc relative to the deutsche mark. For France, adopting the euro meant completely breaking with the past. And France has not yet made that adjustment. France cannot ignore the need to make profound internal reforms. As long as the country shares a common currency with Germany, it will not regain competitiveness without reforming its labor market and reducing its public spending. And reform it must. Without structural changes it will not grow, and without growth it will not be able to contain its debt. Regardless of who wins these elections, the eurozone is facing two possible futures. The first is more optimistic: The new French president sets in motion the profound structural reforms his country needs, loosening labor market rigidities, reining in entitlement benefits (such as the retirement age), reforming the civil service, and reducing public expenditure. These reforms—similar to those being implemented in Ireland, Greece, and Spain—would require political courage and involve pain in the short and medium term. They would, however, eventually lead to a revitalized French economy, greater competitiveness, renewed growth, and sustainable public expenditure and debt. The second future is far bleaker. If France does not reform, it will drag down the entire eurozone. Its creditworthiness will decline, leading to higher borrowing costs for the entire region, undermining the strength of the euro, and necessitating an increase in transfers from Europe (that is, Germany) to France. The Germans are, of course, already digging their heels in at the prospect of more resolutely supporting the periphery’s adjustment. But having to support a fellow member of the core would up the ante. If the eurozone project comes to such a crossroads, it will be much more difficult to blame Germany for not doing its fair share. James Bond is a financial expert specializing in infrastructure and extractive industries. He is Senior Advisor to Lazard Frères, an investment bank, and Managing Director of Sequoia Emerging Markets Finance. He has occupied senior positions in the World Bank Group, most recently as Chief Operating Officer of the Multilateral Investment Guarantee Agency. 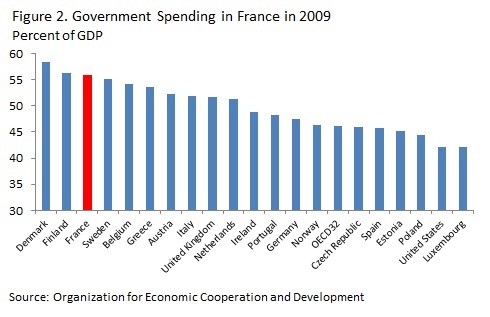 In 2010 health care spending accounted for 11.8 percent of GDP in France as compared to 17.4 percent in the United States. I enjoyed reading James Bond's assessment of economic options and stakes in the upcoming French presidential elections. I agree France faces major challenges for the medium to long term in terms of structural reforms to ensure resumed and sustained economic growth. I would differ on the emphasis he places upon German economic policy as some sort of panacea which France needs to follow to restore its competitiveness. This is important because much conventional policy thinking in Europe has followed this line in recent years - since the 2008-09 financial and economic meltdown - as a basis for justifying the German-espoused policies of short-term budgetary austerity as the main solution to Europe's current economic and financial problems. Underlying this is the presumption - not supported by the facts - that German economic performance has surpassed that of France and other European countries in the recent past. In fact, following reunification in 1990, and in good part because of it, Germany suffered from a prolonged (15 year) period of economic stagnation, only ending in 2005. This was characterized by : very high unemployment rates - well over 10%; a doubling of the central government debt; high fiscal deficits and stagnation in labor productivity. During that period, German labor productivity growth - in terms of GDP her hour worked - was in fact slightly slower than in France and most other Euro Zone countries. 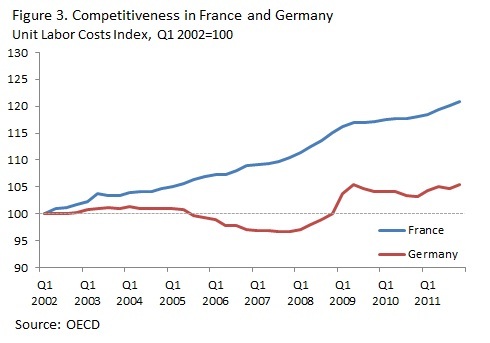 Even in 2010, France's GDP per hour worked is still 10% higher than Germany's, according to the OECD. To be sure France's unemployment rate has been higher. But then Germany pursued a (distinctly non-market) policy of labor subsidies to encourage private firms not to lay off workers. Germany has a similar health care system to that of France with similar cost savings compared to the USA. Meanwhile, Germany faces perhaps greater long-term challenges in terms of population aging and decline and resulting increases in retirement and social security costs. But all of that is for the medium to long term. Surely right now the key challenge is how to spark renewed and sustained economic growth of 2.5-3% p.a. or more. It is quite unclear that German-sponsored austerity has laid the basis for that. Much evidence suggests fiscal austerity has deepened the recession and added to government debt problems. So, let’s hope that whoever wins France’s election pursues a path of growth and not failed austerity. Clearly the "austerity" idea has failed to revive the EU economies. Time to try "growth" which is a euphemism for stimulus. Spain is now asking for growth, with history on its side. Economics is economics, on both sides of the ocean.